As you would expect, I used the opportunity of being in Leeds last week to check out the city centre’s former Woolies sites. 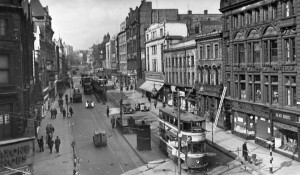 Leeds’ original Woolworths in Briggate – store #5 – was one of the very first to open in the UK, in 1911. 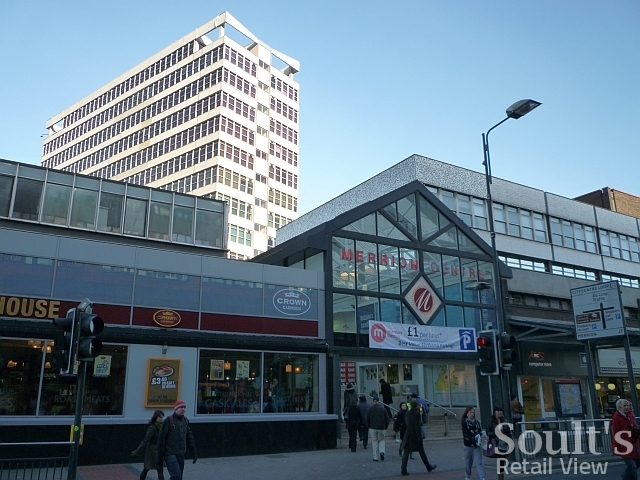 Following a 1959 rebuild, it also became one of the largest city centre sites from which Woolworths ever traded. 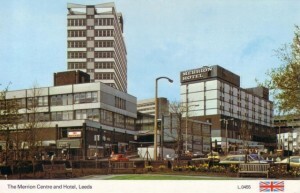 The black and white postcard below shows the store (the prominent white building in the centre) prior to its redevelopment, while the colour view (taken from the opposite direction of Briggate) captures the rebuilt store’s 1960s heyday. 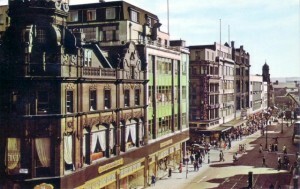 Matthias Robinson’s department store – today’s Debenhams – is visible in the foreground, while Woolworths can be seen towards the far right of the scene. 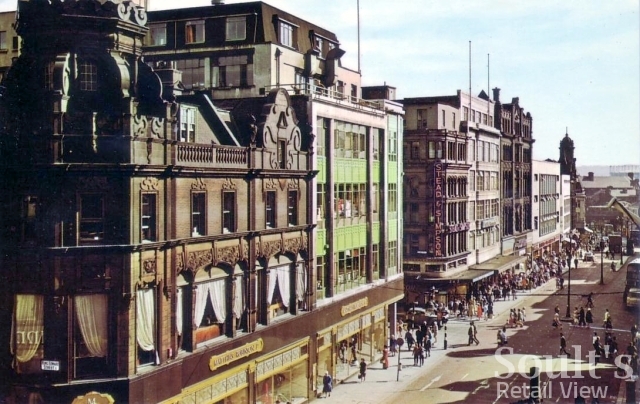 Just as Newcastle’s main Woolies store was sold off in 1984, so the Leeds store was also disposed of in the same year. 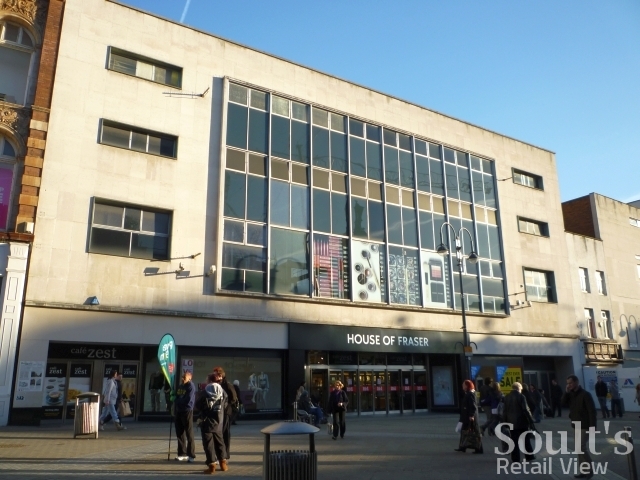 In turn, the House of Fraser-owned department store group Schofields took over the site, in 1988, while its longstanding Headrow store – opened in 1901 on the site of today’s Core shopping centre – was redeveloped and reduced in size. 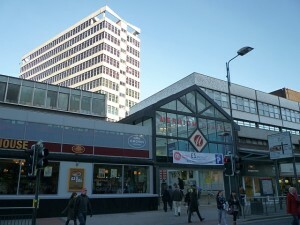 Subsequently, the temporary Schofields (rebadged as Rackhams) was retained alongside the original Schofields store. In 1996, however, the original Schofields on The Headrow was closed down – just six years after it had been rebuilt – while the Briggate store took on the House of Fraser name that it retains to this day. Even now, however, the Briggate frontage is remarkably unchanged from how it appeared as a Woolworths store more than half a century ago. Some time after the Briggate Woolworths closed, a new but much smaller Woolies (#1142) opened in the Merrion Centre at the opposite end of town. This lasted until the retailer’s collapse into administration, closing its doors for the last time on 2 January 2009. 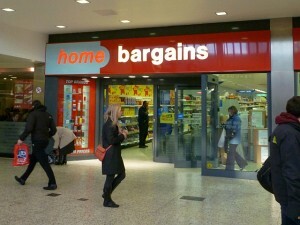 Just days later, however, Home Bargains was revealed as the new tenant of the 15,158 sq ft unit. Conscious of the hazards of shopping centre security guards, I made a point of tracking down the centre manager’s office to ask permission to take a photograph. Given the prominent signposting of the office from the mall, I imagined that the management would be accustomed to – or would even welcome – members of the public dropping in with enquiries. 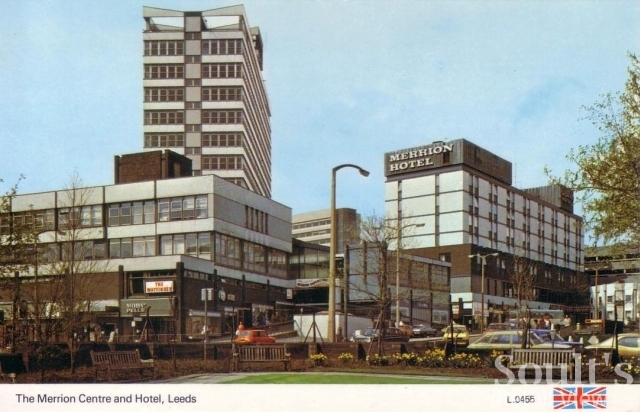 However, even once I’d explained who I was, the reception I received was rather frosty and disinterested – a pity, given that my intention was to say positive things about a centre that is, admittedly, slightly dated in ambience, but has a pretty good mix of value retailers, a strong anchor in Morrisons, and very few empty units at all. Informed that I would have to get permission from the manager of each and every store whose shopfront I wanted to photograph, I duly set off, with some trepidation, to Home Bargains. Happily, the store manager was out and about on the shopfloor, and was delightful – warm, friendly, and pleased for me to take a photograph of his shop. When I was filming with the BBC last year, I gained an equally positive impression of the smart and personable staff in Hartlepool’s Home Bargains store, and it all reflects well on the TJ Morris-owned business. I don’t know if ‘Secret Shopper’ Mary Portas is tackling discount variety stores as part of her current crusade “to give shoppers the service they deserve”, but my experience of Home Bargains certainly suggests that it is possible to build a growing and profitable discount business at the same time as nurturing a friendly, winning workforce.